Most job descriptions are peppered with all the skill sets and experience requirements that make up HR’s fantasy candidate. You know that one – the graphic designer with award-winning web design skills who can also code every programming language known to man. Oh, and did I mention that he’s also an incredible negotiator who can convince clients to double their advertising budget at the drop of a hat? We often think it’s the accomplishments, hands-on experience and hard-skills that ultimately win over hiring managers. And yes, those are likely to weigh most heavily, as they determine your foundation and ability to do the job. But how about those other personal aspects that have proven an asset in your career? Such as your ability to build a strong rapport with clients and retain/grow their business? Or your ability to lead a team of cranky, frustrated designers through an all-night session of fixing the company website that just crashed? Newsflash: companies need, and want, people like that. 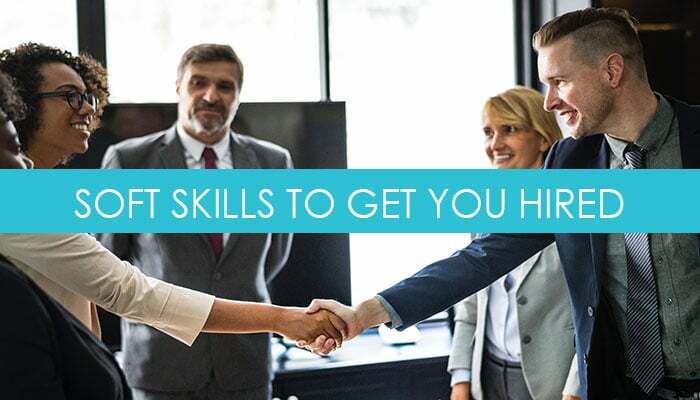 For the most part skill sets like these fall into the category of “soft skills”, personal attributes that enhance a person’s performance and interactions by complementing their hard (or learned) skills. Often they’re referred to as “interpersonal” skills, but they expand outside the realm of communication and customer interaction to include other proficiencies like creative problems solving, negotiation, critical or strategic thinking and other traits. Most employers don’t consider them adequate requirements for the job, because all too often they see candidates claiming them without any context to back them up. You can make those otherwise “blah” skills actually work in your favor by pointing to unique examples of value that you bring to the table. The trick here is to understand why those skills are of value by providing examples of how you’ve leveraged them in the past. This is less about having a creative portfolio and more about how you tackle problem-solving and finding interesting, effective solutions to common (and not so common) challenges. Creativity is key in a sales role, for instance, when you’re constantly faced with clients who don’t understand the value of what you’re selling and are hesitant to make an investment in a “nice to have” versus “need to have” product or service. How do you get that message of value across the client? Many salespeople tell me that it’s about truly knowing your prospect’s business inside and out, feeling their challenges, and then being able to offer innovative solutions that not only speak to their needs but respect their budgetary constraints. You might not be physically handling the social media or website design functions day to day, but illustrating your technical savvy positions you as someone who understands what’s currently being utilized and leveraged by your competitors. Where this is really going to be effective is if you understand what role these technologies play for the organization – are they underrepresented in the social media space, lacking a cohesive online brand presence, falling short of the same levels of customer engagement as their competitor brands? It may not be part of your job, but it’s still valuable insight that you bring to the table. Management & leadership skills are something to be developed at any level of your career, not just when you’re pursuing a role where you’re leading a team or managing direct reports. It goes beyond organizational structure and hierarchy. Leadership is about taking initiative, developing creative vision, seeing opportunities to leverage your knowledge and expertise, and having the confidence to bring that to the table. Where have you stepped up in the past on projects, brought in new ideas, or assumed responsibility for something that was maybe outside of your role? You don’t have to own a business to understand the idea of an entrepreneurial mindset. One of the facets of entrepreneurship is being able to manage yourself – your time, your workflow, and thus your productivity. You know how to navigate a less structured environment as much as you can follow the protocol in a very structured role. It’s also about being able to look at the organization as a whole and understand how your role and the work that you do contribute to the overall growth and goals of the company. Think of your role as your own ship, and you and only you are accountable for running it day to day, seeking out the necessary resources you need to do the job, and tracking your progress. Another piece of this is being able to think like a manager (or CEO), even if you’re not one. A friend of mine was sweating a conversation with his CEO the other day in regards to a website project he was managing that was behind deadline. Even though there were other people involved, he was afraid the blame and accountability for it not being done would be placed on him, and he immediately felt on the defensive. Being someone myself who runs a business, I told him to put himself in the CEO’s shoes: “Your website is your core product. Are you more interested in scolding your employee and blaming them for it not getting done, or in walking out of that meeting understanding WHY it’s not done, what needs to happen to move it forward, and with a definitive timeline of when you can expect it to be up and running?” Sure enough, that’s all he wanted – a game plan. An entrepreneurial mindset means being able to step back and take yourself out of the equation on a personal level and understand what the higher objectives of the project and the organization are. What soft skills do you possess that can potentially give you a step up? What traits have proven valuable to you in the past, and how might you position those in your next conversation, so that you’re able to differentiate yourself from candidates with similar skill and experience-based qualifications? If you’re unclear on it, ask a coworker, a friend or even a former supervisor to provide some insight on your best professional and personal qualities, and how you’ve illustrated those in the past. Ready to hire a professional resume writer to showcase all your skills? Contact us. Tags: career, communication, creativity, hr, job search, marketing, personal branding, shameless self promotion. Bookmark the permalink. Beyond Experience: What Stands Out on a Resume? @Employment Agencies Melbourne: Creative professionals have the added advantage of being able to represent their skills visually, versus just on the resume or in the cover letter. At the same time, it can also be a challenge if you don’t have a portfolio that adequately illustrates the quality of your work, and often that’s the initial/key thing they’re judged based on. Still, they face the same challenges as any other industry as far as competition. Thanks! Creative professionals have the added advantage of being able to represent their skills visually, versus just on the resume or in the cover letter. At the same time, it can also be a challenge if you don’t have a portfolio that adequately illustrates the quality of your work, and often that’s the initial/key thing they’re judged based on. Still, they face the same challenges as any other industry as far as competition. Thanks!